Using milk directly from high altitude dairies on the Italian Alps, Di Lorenzo Gelato is a ready to use Italian Gelato mix. This product combine Italian quality with modern convenience of a pre mix product that does not need refrigeration beforehand. It is made using only high quality milk and all the ingredients are of Italian origin. 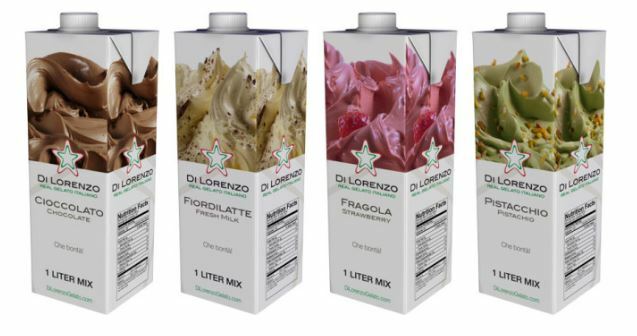 The pre mix comes in different flavours such as chocolate, pistacchio, nocciola and fior di latte. This product is available in 1 liter cartons ideal for home use, but also in 5 liters packages that it is ideal for catering use. Deli and cafe’ owners can make real Italian gelato easily and on demand using Di Lorenzo Gelato. The company is seeking deal with importers and wholesale in the UK, USA and Asia. Be the first to review “Di Lorenzo Gelato – Ready to Use Gelato Mix” Click here to cancel reply.